Four patients with retinitis pigmentosa (RP) had “a sense of sight” restored after implantation of a device for artificial vision developed by Australian researchers. The patients are now in the process of learning how to use the device for mobility and other activities, according to a press release from Bionic Vision Technologies (BVT), the company developing the device for commercialization. Like other devices, the BVT device uses an external video camera mounted on spectacles. Images are processed and transmitted via an implanted microchip to an electrode array. Unlike other devices, the array is implanted behind the retina in the suprachoroidal space. The electrodes stimulate the remaining cells in the retina to generate spots of light, giving the patient a sense of vision, according to BVT. Early clinical work with the device is concentrating on patients with RP. A complement factor C5 inhibitor, administered in combination with an anti-VEGF agent, was well tolerated in a phase 2a trial in patients with wet age-related macular degeneration (AMD), according to the drug’s developer. The trial was designed to evaluate the safety of different dosage regimens of avacincaptad pegol (Zimura, Ophthotech) combination therapy in patients with wet AMD who had not been previously treated with anti-VEGF therapy. This was the first trial to assess the use of a 4 mg dose of avacincaptad pegol in combination with ranibizumab (Lucentis, Genentech), according to a press release from Ophthotech. No adverse events were attributed to the combination therapy. The most frequent ocular adverse events were related to the injection procedure. 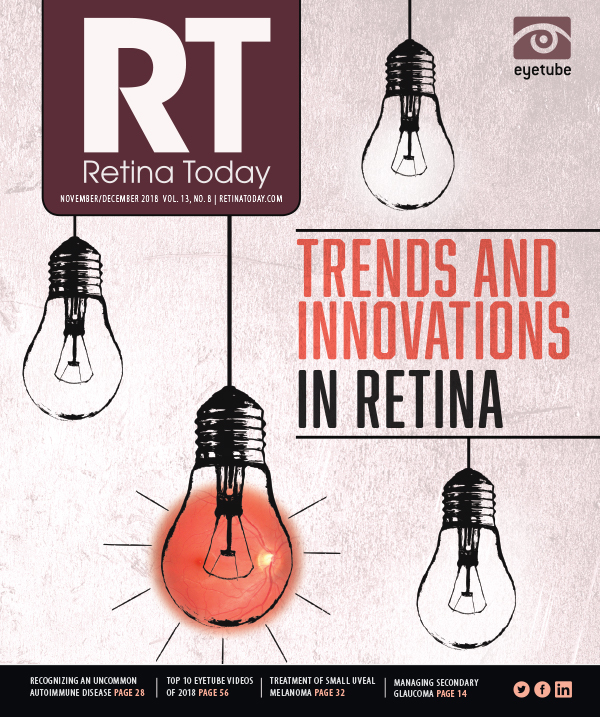 The trial “further reinforced the previously observed safety profile” of intravitreal avacincaptad pegol in combination with ranibizumab in previously untreated patients, said Kourous A. Rezaei, MD, chief medical officer of Ophthotech, in the press release. This uncontrolled clinical trial with a small sample size (N=64) was not designed to detect statistically significant differences between dose groups or to evaluate the efficacy of the combination therapy with statistical significance, Dr. Rezaei said. No additional benefit was seen in patients with retinal vein occlusion (RVO) receiving suprachoroidal triamcinolone acetonide (Xipere, formerly CLS-TA, Clearside Biomedical) in combination with an anti-VEGF agent compared with those receiving anti-VEGF monotherapy, according to a press release from the company. The primary endpoint in the phase 3 SAPPHIRE trial was the proportion of patients in the combination treatment arm with improvements in BCVA from baseline of at least 15 letters, compared with patients in the control arm receiving aflibercept (Eylea, Regeneron) alone, at 8 weeks after initial treatment. Approximately 50% of patients in both arms achieved that level of improvement. In light of these 8-week data, the company plans to discontinue development of this combination therapy for RVO, including the SAPPHIRE trial and another phase 3 trial, TOPAZ, according to the press release. However, the company intends to continue developing suprachoroidal triamcinolone as a monotherapy for the treatment of uveitis, which Daniel White, chief executive officer and president of Clearside, called “our primary indication” for the drug. 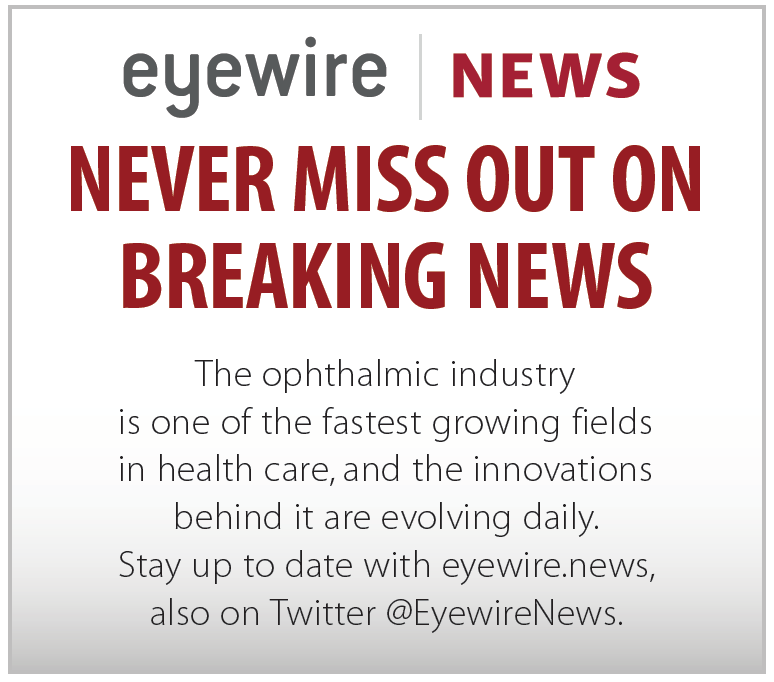 “Awareness and acceptance of the strong clinical profile of [suprachoroidal triamcinolone] as a potential monotherapy in treating uveitic macular edema is growing, and we remain on track to submit our [new drug application] for this indication before the end of this year,” Mr. White said in the press release. Metformin, a common diabetes medication, may be protective against age-related macular degeneration (AMD), according to researchers who presented their findings at the 2018 AAO Annual Meeting. The study’s findings suggested that the antiinflammatory and antioxidative effects of metformin can protect against AMD while it controls diabetes, according to presenter Yu-Yen Chen, MD. Because metformin suppresses inflammation and oxidative stress—two factors that play key roles in the development of diabetes and AMD—the researchers theorized that the diabetes drug might also protect against AMD. Using the Taiwan National Health Insurance Research Database, researchers collected data on all patients recently diagnosed with type 2 diabetes from January 2001 to December 2013, dividing them into two groups: Those who took metformin and those who did not. About half as many patients in the metformin group had AMD as in the control group. The AAO announced plans to construct the world’s first public museum dedicated to vision and eye health. The new museum, to be located in San Francisco, will be launched with a $4 million donation from prominent ophthalmologist Stanley M. Truhlsen, MD. The announcement was made at the 2018 Annual Meeting of the AAO in Chicago. The museum, which is expected to open in 2020, will aim to highlight the rich history of medical and surgical eye care and help people understand their own eye health, according to the AAO. The opening of the museum in San Francisco will enable the AAO to showcase its collection of more than 38,000 artifacts, books, and instruments. Dr. Truhlsen’s gift paves the way for construction of the 3,500-square-foot museum in Fisherman’s Wharf, a major tourist destination. It is anticipated that more than 30,000 people will visit the museum in its first year. The gene therapy voretigene neparvovec (Luxturna, Novartis) was approved by the European Medicines Agency’s Committee for Medicinal Products for Human Use in November. The gene therapy was approved for one-time treatment of children and adults with vision loss due to a genetic mutation in both copies of the RPE65 gene who have sufficient viable retinal cells. The therapy, developed and commercialized by Spark Therapeutics, is licensed to Novartis for development and commercialization in markets outside the United States. It was approved by the US FDA in December 2017. The European authorization is valid in all 28-member states of the European Union, as well as Iceland, Liechtenstein, and Norway, according to a press release from Novartis. The first patient has been enrolled in a phase 3 trial of emixustat HCl (Acucela), a visual cycle modulator, for the treatment of Stargardt disease, according to a press release from the company. The multicenter randomized double-masked study will enroll approximately 160 patients with Stargardt disease at centers in 10 countries, according to Acucela. They will be randomly assigned to oral emixustat 10 mg or placebo (2:1 ratio) once daily for 24 months, to determine whether the drug slows the rate of macular atrophy progression. The FDA has granted orphan drug status to emixustat for the treatment of Stargardt disease, according to the company. Aerie Pharmaceuticals has begun using a manufacturing facility for production of ophthalmic implants using the proprietary particle replication in non-wetting templates (PRINT) technology platform, the company announced in a press release. The technology can be used to manufacture biodegradable polymer implants for sustained delivery of drug therapies to the posterior segment. The facility, in Durham, North Carolina, will initially produce implants to support clinical trials of the company’s AR-1105 dexamethasone implant and AR-13503 rho kinase/protein kinase C inhibitor implants. These implants are designed to allow twice-yearly injections for the treatment of diabetic macular edema and neovascular AMD, according to the company. The Foundation Fighting Blindness announced the creation of a Retinal Degeneration Fund (RD Fund), a not-for-profit subsidiary that will focus on making venture philanthropy investments. The RD Fund, with more than $70 million in initial funding, will invest in companies with projects nearing clinical testing, according to a press release from Foundation Fighting Blindness. Investments will aim to further the foundation’s mission, which is to provide preventions, treatments, and cures for inherited retinal diseases and AMD.